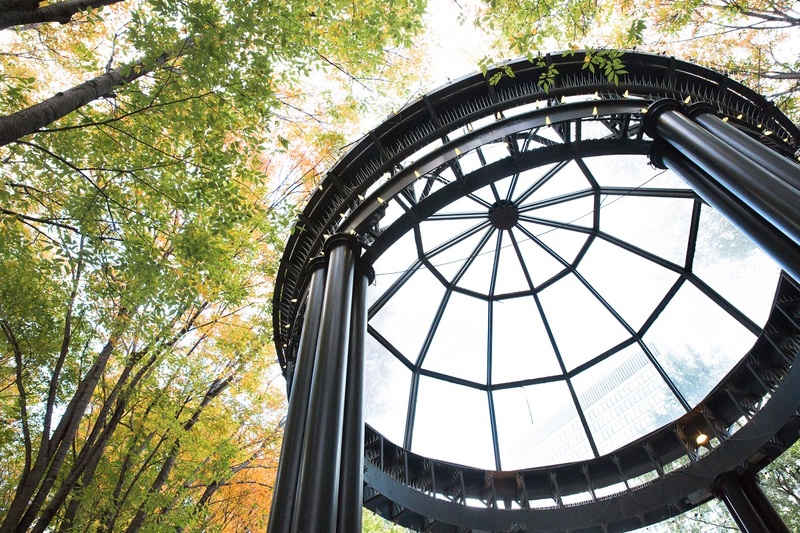 The grounds of Woodruff Park are covered with many interesting features, making it a visually compelling urban oasis. The International Peace Fountain commemorates Atlanta’s pivotal role in the Civil Rights movement. 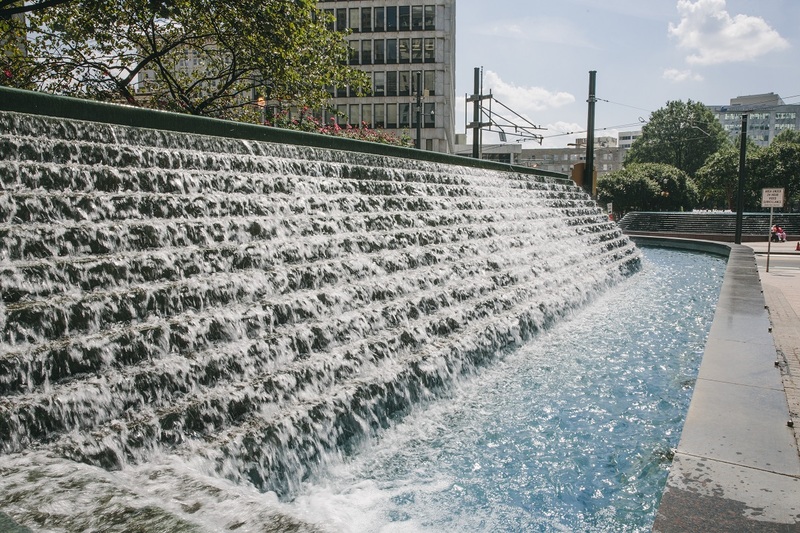 The geyser fountain and water wall are some of the park’s most striking focal points, and they serve as a memorable gateway to Auburn Avenue and the Martin Luther King, Jr. National Park Site. 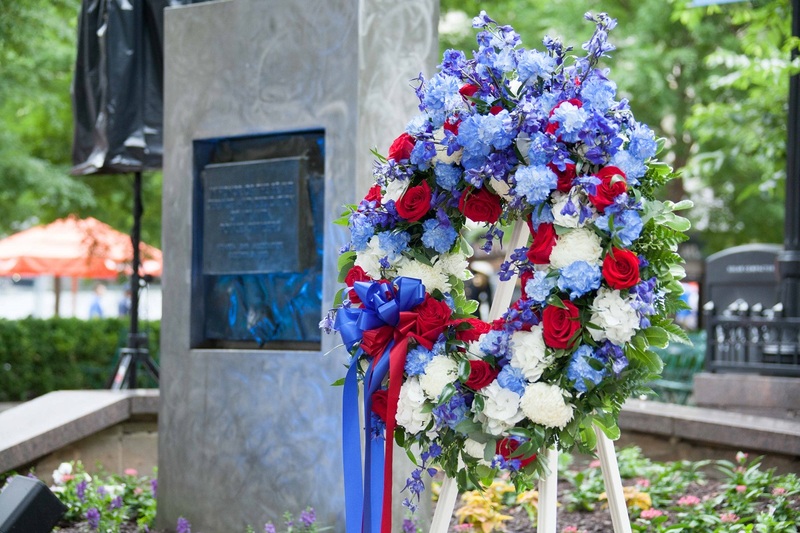 In 1980, the Give Our Police A Hand Monument was dedicated “In Honor of the Brave Service and Dedication of Atlanta Police Officers.” Each year during National Police Week, members of the Atlanta Interagency Law Enforcement (ILE) Partnership hold a public ceremony in Woodruff Park paying tribute to the public safety agencies that serve throughout the city and state with a ceremony and memorial service. The 2004 Shining Light Award honors Mayor Maynard H. Jackson, Jr. "His politics of inclusion made Atlanta government and business open to all citizens." Presented by Atlanta Gas Light Company and WSB Radio. The Gateway to Historic Auburn Avenue is marked with the West African Adinkra symbol, sankofa, meaning "learn from the past." It reads, "Know your past so that you can understand the present and direct the future." Presented by the Corporation for Olympic Development in Atlanta. Nimrod Long and Associates, Landscape Architects and TVS & Associates created the gazebo for the Summer Olympic Games. This custom design consists of an openwork strut cornice assembly supporting an impact-resistant, ceramic fitted glass dome. The gazebo accommodates performances by local musicians, including students from the Georgia State University School of Music. The bronze sculpture by Gamba Quirino, "Phoenix Rising from the Ashes," depicts a woman being lifted from flames by a phoenix in flight. A longstanding symbol of Atlanta, the mythological phoenix represents the City’s rebirth after the devastating fire, part of General Sherman’s March to the Sea, during the Civil War. This piece of history was given to Atlanta by the Rich Foundation in 1967 to celebrate Rich's 100th anniversary. 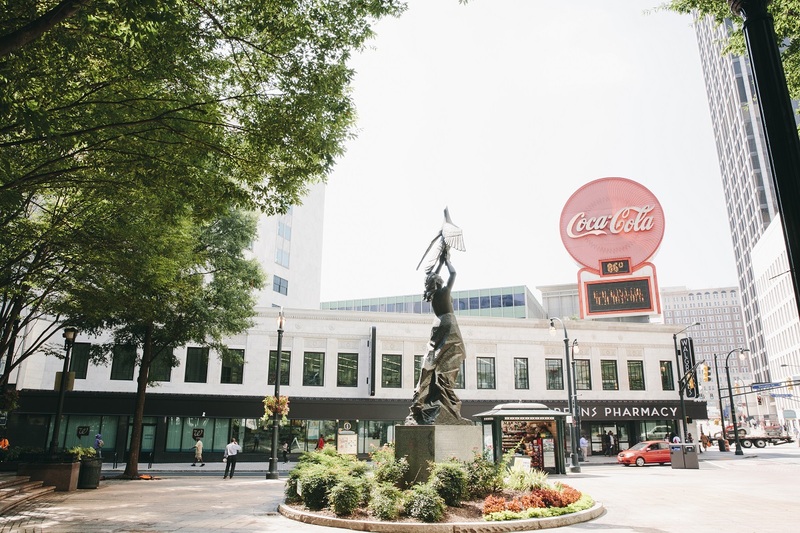 The Phoenix used to be perched at Spring Street and Martin Luther King Jr. Boulevard and now stands at the Five Points entrance of Woodruff Park. Delano, Minn.-based Landscape Structures Inc. engineered and constructed the Woodruff Park playground, which is installed in the park's northwestern corner. Jeff Santos of Coquitlam, British Columbia designed the original concept of the playground, having been named winner of the 2010 Playable 10 Contest held in partnership with Bank of America, Georgia Institute of Technology, CAP and the Atlanta Taskforce on Play (ATOP). Through a generous grant, Bank of America provided the funding for CAP/ADID to host the international competition to select the winning design for the playground. Additionally, the company provided financial support for the construction of the playground. 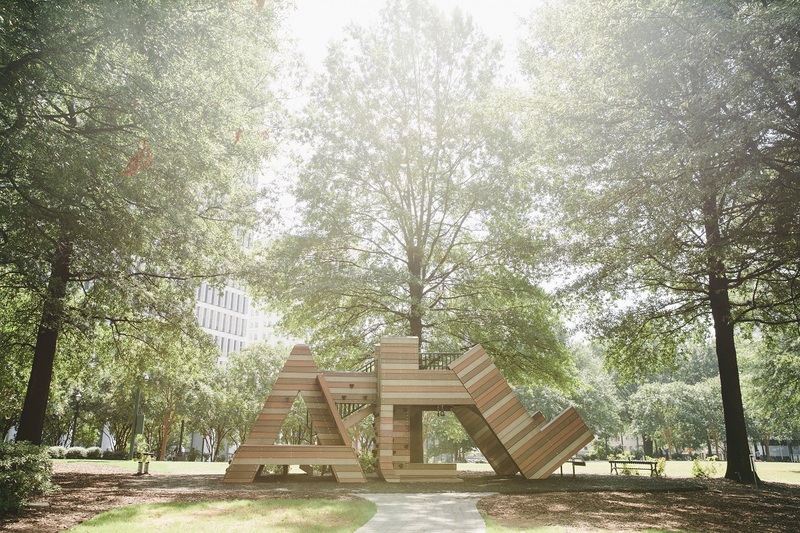 Shaped with Atlanta in mind, the playground’s design mimics the letters “ATL,” and features climbing walls, monkey bars and a slide. Central Atlanta Progress, in conjunction with Am Yisrael Chai!, produces the annual Downtown Daffodil Project in support of the worldwide Daffodil Project. The Daffodil Project aims to build a Living Holocaust Memorial by planting 1.5 million daffodils around the world to remember and represent the one and a half million children who died in Nazi-occupied Europe and and bring awareness to those currently suffering human rights crises throughout the world. The Downtown Daffodil Project began in Woodruff Park, where 20,000 daffodils were planted in 2014. 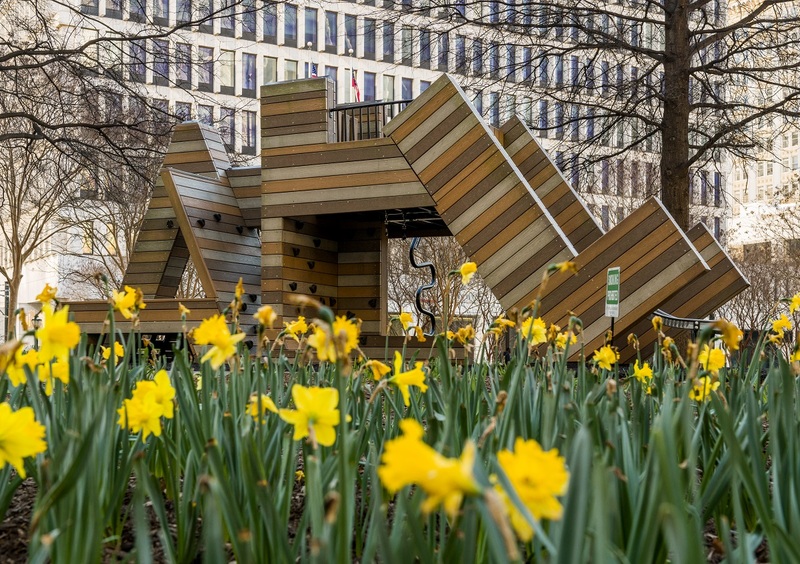 In 2017, Woodruff Park became the site of the inaugural Downtown Daffodil Dash 5K race, as well as the new Daffodil Remembrance Garden, filled with 500 daffodil bulbs planted by the 5K participants. 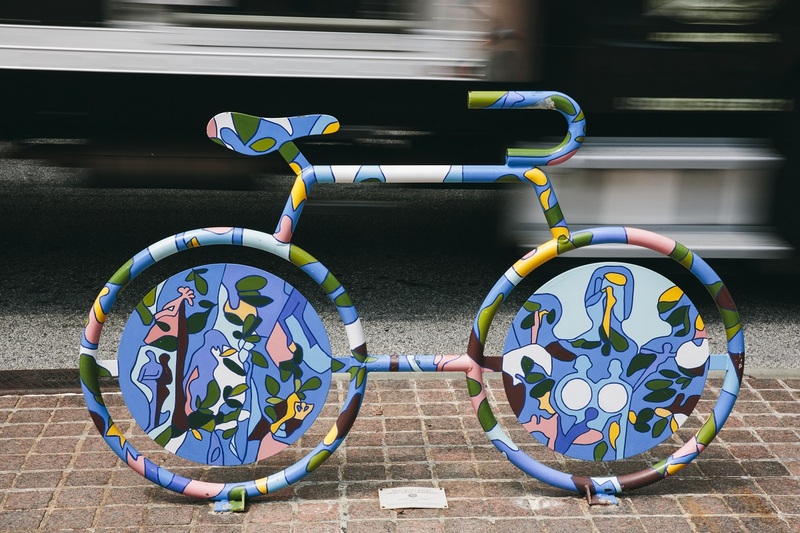 A program of the City of Atlanta’s Mayor’s Office of Cultural Affairs, the Mural Bike Rack Project provided 18 local artists the opportunity to design and paint locally crafted bike-shaped racks installed throughout the community. A mural bike rack designed by Nancy Barbosa was installed in Woodruff Park, near the intersection of Peachtree Street and Edgewood Avenue, in 2016.